Lin et al. have now published a paper that demonstrates overexpression of endogenous genes in Drosophila melanogaster using the CRISPR/Cas system. Over- and miss-expression of genes can be a powerful tool to elucidate gene function and is commonly achieved through the expression of cDNA transgenes. The CRISPR system has been utilised in multiple ways to achieve transcriptional activation of endogenous genes. Early designs were based on single activation domains fused to nuclease deficient ‘dead’ Cas9 (dCas9). However, these dCas9-AD fusion proteins were relatively inefficient and typically required binding in multiple copies to the target locus. This can be achieved in cultured cells by co-transfecting multiple guide RNAs (gRNAs), but co-expression of many gRNAs is challenging in animal models. Recent studies have achieved more robust transcriptional activation with single gRNAs by multimerizing the transcriptional activation domains that are fused or recruited to dCas9. Norbert Perrimon’s lab has now characterized one dCas9-AP design – originally developed by the lab of George Church – in Drosophila. The system is called dCas9-VPR and consists of dCas9 directly fused to a chimeric activator consisting of domains from VP64, p65 and Rta. Co-expression of dCas9-VPR with gRNAs can induce overexpression of a number of genes in cultured S2R+ cells. The extent of over-expression varies between target genes and genes with low basal expression level tend to be more sensitive to CRISPR induced transcriptional activation than genes that are already expressed at high level. Furthermore, only certain gRNAs are able to mediate robust transcriptional activation. Unfortunately, it is currently unclear how to predict gRNAs that are active in combination with dCas9-VPR, as gRNAs that mediate efficient double strand breaks with active Cas9 are not necessarily active with dCas9-VPR. The authors therefore suggest to co-express two gRNAs to increase the chances of experimental success. Cas9 as a transcriptional activator. 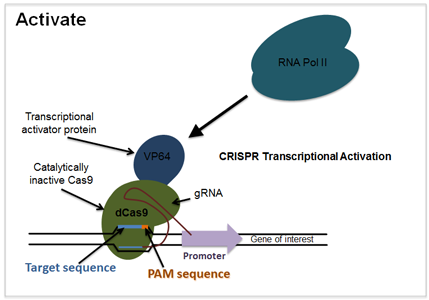 Image from Addgene’s ‘CRISPR in the Lab: A Practical Guide’ https://www.addgene.org/CRISPR/guide/ an excellent source of design and use guidance and resources. Lin et al. also present an elegant example of an application of dCas9-VPR mediated transcriptional activation. They induced expression of two transcription factors, twist and snail, either alone or in combination and subsequently measured global gene expression levels by RNA sequencing. This did not only confirm the expected upregulation of twist and snail, but also a number of other genes with up- or downregulated expression. Reassuringly, many of these genes have been previously shown to be bound by twist and snail and therefore represent good candidates for target genes of these transcription factors. Whereas most experiments in this paper were done in cultured cells, the authors also present evidence than dCas9-VPR can activate transcription in vivo. To this end they generated dCas9-VPR and gRNA transgenes targeting the wingless locus. Co-expression of these transgenes caused ectopic expression of wingless in epithelial cells at a level sufficient to induce a dominant phenotype. In summary, this is an interesting paper that for the first time demonstrates CRISPR mediated transcriptional activation in insects. The technique should be a valuable complement to conventional loss-of-function studies and should be transferable to any other insect species that is amenable to transgenesis. Lin, S., Ewen-Campen, B., Ni, X., Housden, B. E., Perrimon, N., 2015 In Vivo Transcriptional Activation Using CRISPR-Cas9 in Drosophila. Genetics: doi: 10.1534/genetics.115.181065.